Made in the tradition of the smoked beers of Europe. 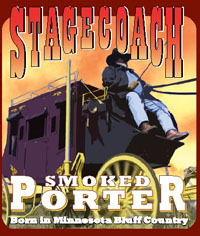 Ingredients used in this unique creamy dark beer include smoked and chocolate malts that combine for a subtle licorice-like flavor and with chocolate overtones. A traditional golden ale, and the brewery’s second brew. Our Golden is made with four varieties of premium malts to give a clean, smooth flavor. Brewed with generous amounts of noble hops, honey malts are added to balance the hop bitterness and to bring a touch of sweetness to the finish.